Meensel-Kiezegem is a very small town at the heart of Belgium, 40km from the Brussels capital city and 20km from the famous university city of Leuven. During the first years of the German occupation in the Second World War, there was no real impact in the village. There were inhabitants partaking in Flemish resistance and collaborator organizations. It was already a few weeks after the D-Day landings, when the German army was on its retreat that the tensions rose in the village. On July 30, 1944 Gaston Merckx, a collaborator, was shot by three unknown resistance people from outside the village. At her sons funeral, the mother of Gaston Merckx asked for 100 hostages as revenge. A first raid was conducted on the 1st of August, 1944. Masked men and men in uniform went form house to house to find resistance fighters. 3 men were shot on the spot: August Craeninckx, Petrus Vander Meeren and Oscar Beddegenoots. 4 women, 10 men and 2 children were arrested. On the 11th of August, 1944 a second, more organized, raid took place. Jules Schotsmans died when he couldn’t get out of his farm that the Nazi’s set on fire. Under command of SS-commanders Robert Verbelen and Tony Van Dijck, 10% of the village inhabitants were arrested and taken in trucks to the prisons of Leuven and Sint-Gillis (Brussels), including the Canadian pilot Edward Blenkinsop, who was hiding in the village. From there one they were deported to the concentration camp of Neuengamme in Northern Germany. 28 of the hostages were freed on the last transport from Belgium to Germany. There the people from Meensel-Kiezegem had to work as slave laborers in the clay mines, the weapon factories and were distributed to satellite camps to aid in the German war economy. Of the 72 deported men, only 8 survived these conditions and were able to return to Meensel-Kiezegem. 63 inhabitants died in the concentration camps. 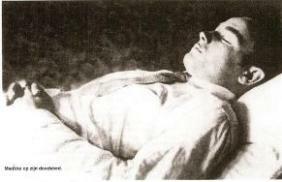 Collaborator Gaston Merckx on his deathbed. 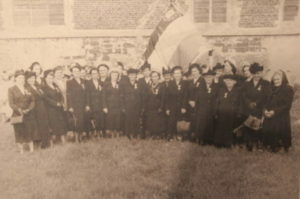 The widows of the hostages of Meensel-Kiezegem in front of the town church. 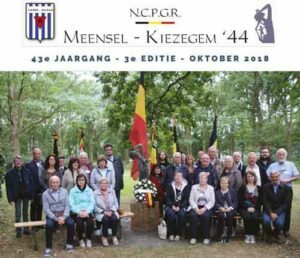 The Meensel-Kiezegem '44 foundation organizes a trip to Neuengamme every year, where they visit the statue 'The despair of Meensel-Kiezegem', erected in the former gardens of the SS.